EXPERIENCE A curated atmosphere of music, food and art in the heart of Rosebank. Re-United and Re-Energised. Afro pop group Bongo Maffin has released their single Harare. Catch them live at MESH Club, Rosebank on Sunday. Motus@Mesh is your ideal hangout for young and hippies, where they unwind and let the hair-down with a live music band. It offers a series of events that offer good vibrations – on any given Sunday – where MESH Club will be the catalyst for good times only. 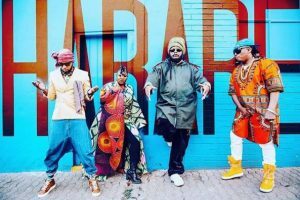 This weekend on Sunday 9 December they host Afro Pop group Bongo Maffin, that has just released their latest single Harare (or ha ba robale in SeSotho or they don’t sleep in English). Started in 2014 the award winning group has re-united and their bookings have gone as far as East Africa, including Botswana. They will share the stage alongside Thabsie- 3 time SAMA nominee, composer and Memphis born Kenneth Whalum. The decks will be guarded by DJ’s Akio, Kaygo, BmoE, P-Kuttah and Tha_Muzzik. SLM is giving away 5-double tickets to our readers. Where and when will this weeks’ event take place? Send answers, name and contacts to info@sowetolifemag.co.za or sydney@sowetolifemag.co.za on or before Friday 7 Dec 2018.